Time to Put Some Spring in Your Step! Form your team of 4 to 20 people, designate a captain, and decide together which division you’ll be competing in. Captains: click here for your official Captain’s Guide with information on divisions, team naming, and your responsibilities as team captain! 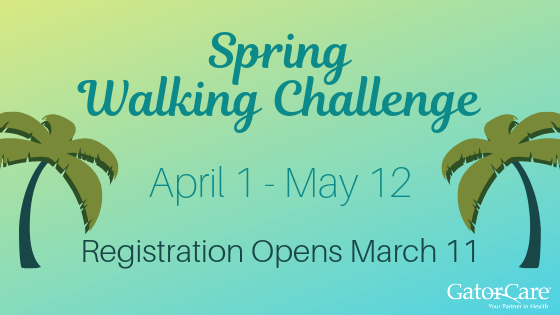 You will create your Walker Tracker account and join your team for the 6-week Florida Coastline challenge. We encourage you to download the Walker Tracker app to easily check your progress from your phone. Walker Tracker syncs with most wearable devices, as well as many phone apps. You will walk your heart out for six weeks, regularly syncing your steps with the Walker Tracker platform. Your team’s ranking is based off of your team’s average (which levels the playing field for teams of different sizes) and will display in your team page in real time. HOWEVER, this is the ranking for ALL teams, not just the teams in your division. Therefore, your accurate team ranking within your division will be sent via email at the beginning of each week. GatorCare will move your teams between divisions at our own discretion (we will let you know if we are moving your team). Participants told us that it seemed like teams were self-selecting incorrect divisions, which led to huge discrepancies within divisions. One individual cannot be on multiple teams. If we see that someone is on multiple teams, we’ll reach out to that person as well as the team captains and ask them to choose one. You can only re-name your team once, so make sure you’re naming your team correctly! If your team isn’t named with a division number first, we will automatically place you in the Ultra-Competitive category (and we will reach out to let you know before we do that). This is a steps-only challenge, meaning that if you enter converted activities on Walker Tracker, they will not count towards your steps. This is because most wearable devices will convert steps and this will prevent people from mistakenly double-entering steps. Once you select your method of step entry (manual or device), you cannot change it. So if you had syncing issues during the past challenge, we recommend selecting manual entry. Walker Tracker syncs with all major wearable devices. If you do not have a wearable device you can use various phone apps to track your steps. Visit this page for a full list of compatible devices and apps. Once you set up your account and log in, you will see a button on the right side of your screen that allows you to connect your device. Follow the on-screen instructions. If you already did this for the fall challenge, you should be all set. Optional but recommended: Download the Walker Tracker app to check your team’s progress throughout the challenge. Due to the large number of participants and complexity of diagnosing issues, we encourage you to use the blue ‘Support’ button in your Walker Tracker portal as your first line of defense for any questions or issues. If you have exhausted all resources and still have questions, you can email Brittany. Steal the trophy from the previous challenge winners! The winning teams will have their team name added to the trophy and get to house the trophy until the next challenge winners are announced.